Overwhelmed and stressed out, what’s actually going on inside of us? Many times, our emotions and our feelings of stress are interconnected. Have you ever wondered where our emotions come from? Emotions are often rooted in our desires. Desires are powerful motivators. They are things that we want to have happen in our lives, but we don’t fully control. This can cause us stress. When we understand the link between our desires and our stress, we can begin the process of reducing many of the stressors we have in our lives. Let’s begin by accepting the fact that we can’t exist without desires. When we wake up, feeling groggy, we want a shower and a cup of coffee. Those “wants” are desires. If we’re so depressed that we want to crawl into a hole and hide, that’s still a desire! When our desires are met, we generally experience pleasant emotions. But unmet desires can be sources of stress, moving us toward the Unhealthy Stress zone. This stress, however, is self-made. It is a result of having desires that can’t be met at this time. Perhaps they can never be met. When we acknowledge that we hold unreasonable desires, ones that can’t be fulfilled, a powerful secret is revealed. By identifying these unmet desires that act as stressors in our lives, we can take steps to change them into realistic goals which can be met. And the great thing about this is that not only do we reduce our stress, but we get the bonus of experiencing greater amounts of pleasant emotions. 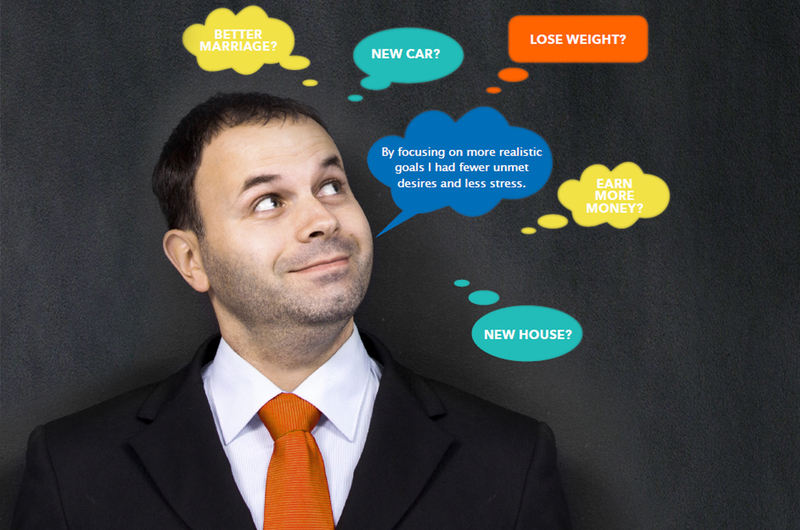 Check out how your desires have the power to reduce stress or increase it. 2) He desires to be a good employee and get his report done. Jeff realizes that, because of his limited resources if one desire is met, the other one will be unmet. Jeff decides to focus on realistic goals. He talks to his boss, admitting that, in the limited time; he can’t simultaneously do both successfully. His manager lets Jeff defer his monthly report for a week. Jeff is now able to finish the presentation and practice it with a work colleague. He’s feeling confident, prepared, and his stress level has decreased. Jennifer is a single mother of two and works at a nursing home. Her mom, who usually watches the kids during the day, has been having some health problems recently. Each morning, Jennifer feels stressed because she doesn’t know if her mom will be up for babysitting and Jennifer can’t afford to miss shifts. She desires reliable childcare, but she can’t afford full-time day-care. Realizing it’s not fair to rely on her mom for babysitting all of the time, Jennifer focuses on some realistic goals. Exploring various options, she makes arrangements with her neighbor to watch the kids when her mom isn’t feeling well enough. Also, the community centre day-care has drop-in space for when Jennifer’s mom and neighbor aren’t available. Jennifer’s early morning stress has been reduced. Becoming aware of our desires, and admitting the limitations of our resources to fulfill those desires, is the first step to setting realistic goals. These realistic goals are ones that we can control. Try it yourself – you have only your stress to lose!